Supplier numbers hit 2,500 – what they are telling us. We now have over 2,500 suppliers using the Supplier Engagement Tool to create their free sustainability action plans. 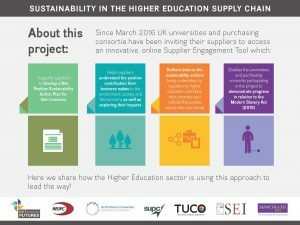 Our new four-page ‘infographic plus’ gives a visual representation of what those suppliers are telling us and their university/consortia customers through the issues and actions they have selected.